Welcome to Specialty Orthopaedics. We are an orthopedic surgery practice based in Hermitage, PA with a second office in Grove City, PA. 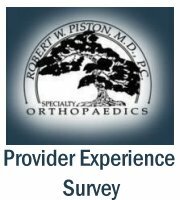 Specialty Orthopaedics was founded in 1994 by Dr. Robert Piston, a Board Certified orthopedic surgeon. 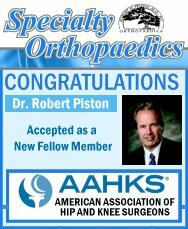 A surgeon for over 25 years, Dr. Piston completed fellowships in both hip and knee replacement surgery and hand/upper extremity microsurgery. Knowing patients and their families lead very busy lives, Specialty Orthopaedics maintains an 11,000 square feet, state-of-the-art rehabilitation center which is conveniently located below our Hermitage medical offices. Our professional, friendly rehabilitation staff specialize in the care and treatment of all orthopedic conditions and treatment options are always based on the patient’s individual needs. Adjacent to the rehabilitation center is our wellness center that provides customized fitness and exercise programs for all age groups. Our wellness center has a long history of developing successful programs for adults, children, athletes, senior citizens and individuals with “special” needs. Specialty Orthopaedics is truly the one stop for Excellence with all your Orthopedic, Sports Medicine, Podiatric, Rehabilitation and Fitness needs. You can rest assured our number one priority is always the patient. Please browse our website and feel free to call with any questions or to request a tour.